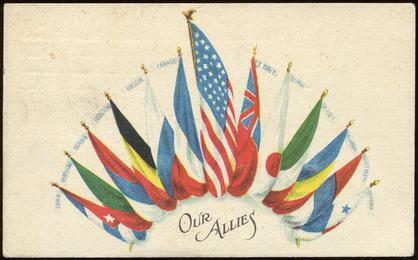 Serbian History 101 - WWI-Allies Postcards- Serbia Included! Serbian flag, second from the left of Freedom flags. 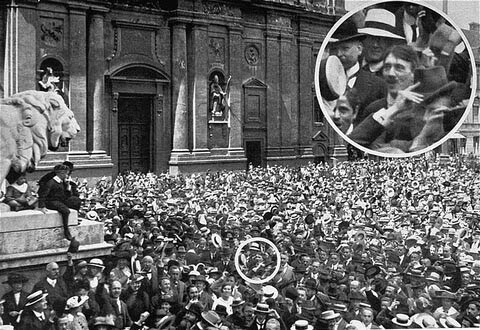 Some of the newest literature on certain websites seem to want to ignore the fact that Serbia was with the Allies in both WWI and WWII. I found one postcard site from a well-known University that named every other nation's flag on the postcard, but when it came to Serbia, the description was "Eastern European." The administrator apologized to me when I pointed out the error. He blamed the oversight on an intern's work, and promised to rectify the situation. I am very grateful to him and look forward to his follow through. Luckily for me, I was able to add my own collection of ALLIED WWI postcards Thursday, September 24, 2009 at the Renninger Flea Market near Kutztown, PA. 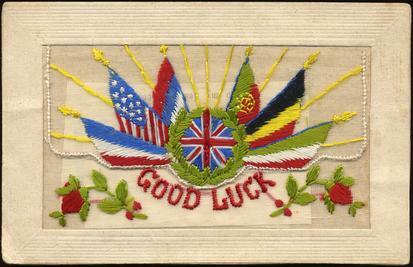 I purchased ten additional WWI beautiful "Silks" (embroidered postcards) from Dr. Victor J.W. Christie, Appraiser and Author, and owner of THE CHESHIRE CAT, LTD. The kind and knowledgeable Dr. Christie was a teacher, Superintendent of Schools, and a recognized authority on the works of Bessie Pease Gutmann. Each one of the cards I purchased from him showed the flag of Serbia (Servia), the red/blue/white banner so familiar to all of us. The Serbian flag is 3rd from the left on the card above. I purchased all the Pantheon ones featuring the Serbs decades ago. If memory serves me correctly, I think the Serbs were selected to be the FIRST of all nations to go through the Arc de Triumphe for all they suffered, losing half of their male population and a third of the female population that had to retreat to the isle of Corfu. After resting and thanking the Greeks, the Serbs came roaring back to help win the war. 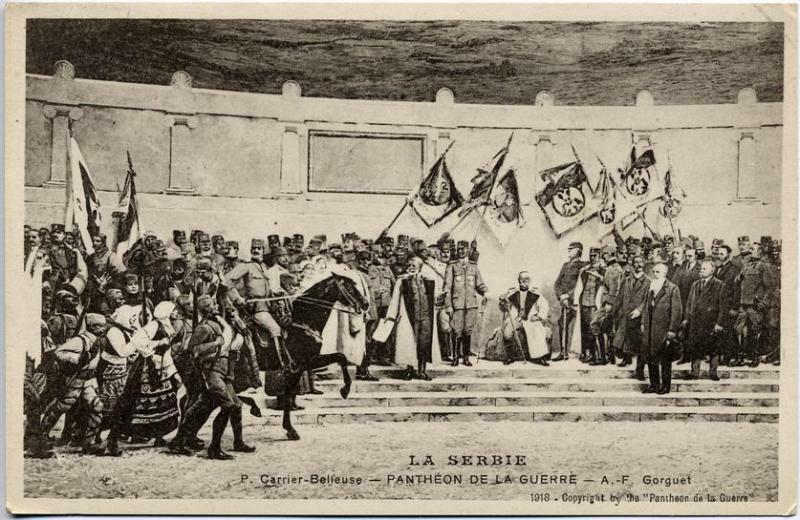 In the postcard above, the Ally Serbs were led by King Peter (seated in the middle here) and Prince Aleksandar (shown on dark horse to the left). Nikola Pasich prominently stands to the right, with all the Serbian banners of the Serbian Divisions in the background. Serbian peasants on the left join the soldiers on the right hand side in Victory. Inside is a card that reads "Sweetheart Mine." More than the greeting tells!" 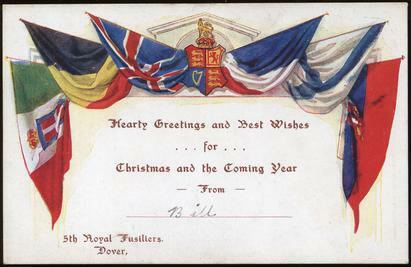 Bill was in the 5th Royal Fusiliers stationed from Dover! Subject: War with the Serbians is never a good idea. It might behoove the great powers of today, in the 21st century, that it's not necessarily wise to mess with Serbia and the Serbians. 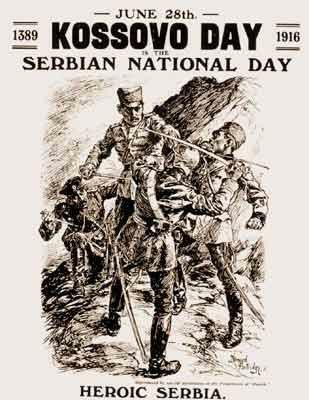 The poster above of Heroic Serbia fighting off her enemies from all sides was created by the very famous poster maker, Bernard Partridge. This first appeared in PUNCH, or the London Charivari, Oct. 27, 1915. This says it all! Good Luck! Dr. Christie said that the embroidered "silks" were first produced in 1914 through 1918 and declined greatly from 1919 onwards. The cards were hand embroidered on strips of silk mesh with as many as 25 on a strip. Mostly they were produced by French and Belgian women refugees who worked in their homes and refugee camps, and the sent the finished strips to factories for cutting and mounting on postcards. The Serbian flag is again the first one to the far right on top of the cannon here. Some of the cards purchased had the central portion cut as a flap so that a tiny printed greeting card could be inserted in a pocket behind the silk front and the stiff back. One of these said, "To my Sweetheart" and definitely showed the Serbian flag as you can see here below. 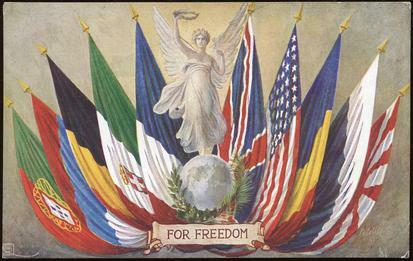 The cards became treasured momentos from "the boys over there" and are excellent examples of front-line patriotic art quite unique to this specific period in history. Dr. Christie estimates that as many as 10 million handmade cards were produced during this WWI period. In 1930 through 1945 a machine made card was produced which was simpler and plainer with less variations. These Silks, he said, never regained the popularity of their WWI predecessors. 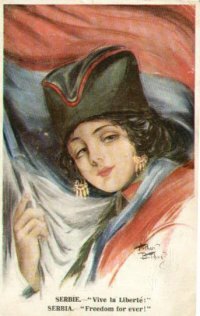 This "Forget-Me-Not" card found inside featured the Serbian flag far right, the first one, a Souvenir of the Great War. This 1918 "Silk" featured the Serbian banner on the bottom half of the number 8 above. 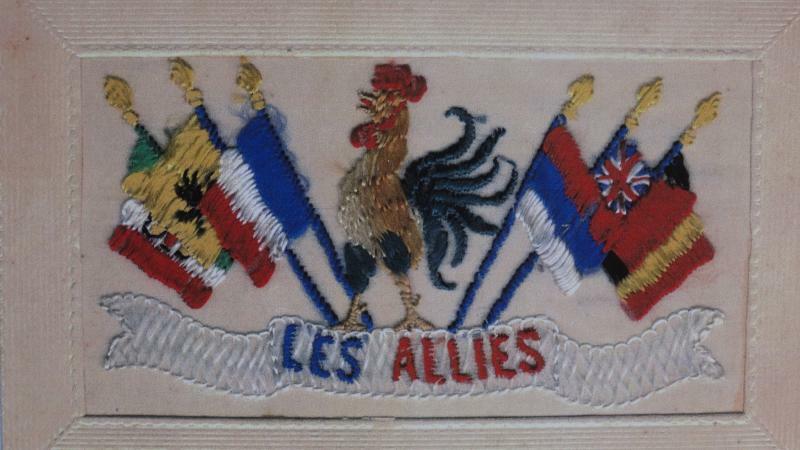 A Souvenir of France from 1919, and the Serbian flag is featured far right. First. This time the Serbian flag is far left, the first guarded by the encompassing American flags. This is the outside of the silk postcard with the "Forget-Me-Not" note inside with the Serbian flag. On the outside, embroidered here, the Serbian flag is right in the middle! Don't ever be afraid to stand up for the truth. Here's a photo of a WWI postcard, courtesy of John Mrmak. Thanks, John!